A small (L 25 cm) large-headed owl. 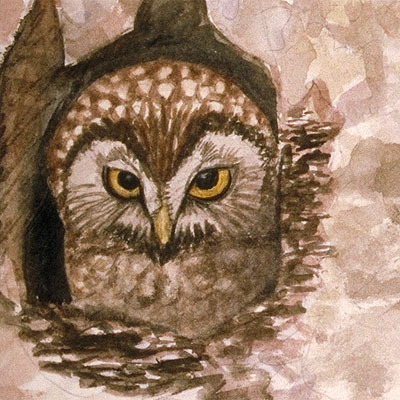 Tengmalm's Owl is decidedly nocturnal and difficult to see. The species inhabits pine and fir forests with dense grove, at altitudes of up to 1,600 m, between old trees and it is often encountered at edges of glades. It is dependent on availability of small mammals. Resident. Tengmalm's Owl is threatened by deterioration and degradation of habitat (forest exploitation and afforestation) and disturbances at the breeding sites due mostly to tourism development and sports activities.